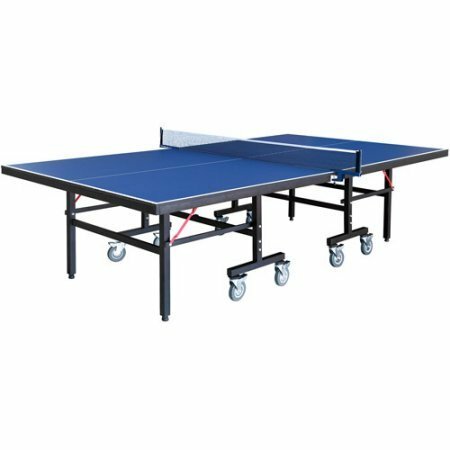 Have a blast with the Hathaway Back Stop Table Tennis Table. Back Stop is built with strong 1-3/8 inch powder coated steel legs that make this table extremely stable and easy to play. The high grade 3-inch locking wheels make moving Back Stop quick and easy. The heavy duty 3/4-inch thick CARB certified MDF playing surface is coated with 20 layers of high quality coating that ensures a uniform, consistent bounce. The table folds at the center for individual practice. Both ends of the table fold up for compact storage when not in use. An easy to use, unique safety mechanism locks the table during normal play or storage. Back Stop comes complete with two table tennis paddles and two balls.